Not all taxpayers are taxed at the same rate. The U.S. tax code is set up so that a guy who earns $30,000 a year doesn't pay the same percentage of his income as someone who earns $150,000. 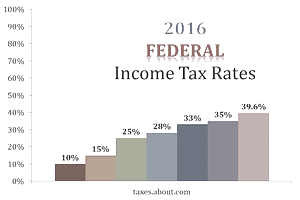 Income is divided into "tax brackets" and a percentage rate applies to each bracket. As of the 2016 tax year, these percentage rates begin at 10 percent and gradually increase to 15 percent, 25 percent, 28 percent, 33 percent, 35 percent, and finally to a top rate of 39.6 percent. Where each of these tax brackets begins and ends depends on your filing status. Congress adjusts the tax rates periodically—or, more specifically, the incomes that correspond with them. Tax rates can also vary depending on the type of income you have. A separate tax rate schedule applies to income from long-term capital gains and qualified dividends. These brackets apply to income you earned in 2016 for which you would file a tax return in 2017. The chart below shows the ordinary tax rates in the first column and the rates for long-term gains and qualified dividends in the second column. The rest of the columns show the beginning and ending income perimeters of each tax bracket grouped by filing status. These dollar amounts apply to your taxable income—what's left over after you've taken the standard deduction or itemized your deductions and you've claimed any other deductions that you may be entitled to, such as for dependents. If you're a single individual and you earn $90,000 a year, you'd fall into the 25 percent tax bracket. That's the easy part—it gets a little more complicated from there. You'd actually pay only 10 percent for the portion of your income that falls between $0 and $9,275, and you'd pay 15 percent on the portion between $9,276 and $37,650. That 25 percent tax rate would only apply to the balance of your income. Each percentage rate corresponds to that portion of your earnings. President Donald Trump has proposed whittling these tax brackets down to just three: 10 percent, 25 percent and 35 percent, but that has not yet happened midway through 2017. If you want to crunch numbers and do the math, it works like this: Take your taxable income and subtract the amount where the relevant tax bracket begins, which would be Columns A and B. This leaves just the taxable income within that tax bracket in Column C. Then multiply this amount by the tax rate for that bracket—Columns D and E.
This is the amount of tax that would be due on the income within that tax bracket. Then add to this amount the cumulative federal tax on income that falls in the lower tax rates, represented in Column F. This will tell you the total amount of federal income tax owed in Column G.
Edith is responsible for paying $21,036.75 of federal income tax on taxable income of $100,000. Her income over $91,150 is taxed at the 28 percent rate. The rest of her income is taxed at the lower 10 percent, 15 percent and 25 percent rates. Edith's "effective" or average tax rate is her tax liability divided by her taxable income: $21,036.75 divided by $100,000, or 21.03675 percent. The effective tax rate is a blend of all the tax rates that apply to your income so it's typically less than your tax bracket rate. Social Security tax is imposed at a rate of 12.4 percent on wages and on self-employment income up to the annual Social Security wage base of $118,500. This wage base increases to $127,200 in 2017. Only income you earn up to this amount is subject to the Social Security tax. These taxes apply pretty much to all earners, but the self-employed must pay this full percentage of both taxes. Collectively, this is referred to as the self-employment tax. Taxpayers who are employed by others pay only half these percentages. Their employers must pay the other half. If you have long-term capital gains or qualified dividends, use Worksheet 2-7 in combination with the tax rate charts (Worksheet 1-6), both of which can be found in IRS Publication 505. You can use these tax rate schedules and your marginal tax rate to help plan your finances in a number of ways. They'll tell you how much tax you'll pay on any extra income you earn, such as if you decide to take on a second job that increases your overall income to a higher tax bracket. They'll also tell you how much tax you'll save if you can increase your deductions. For example, if you fall into a 28 percent tax bracket, you'll save 28 cents in federal tax for every dollar you spend on a tax-deductible expense, such as mortgage interest or charity. Tax laws and rates can change periodically. Always consult with a tax professional for the most up-to-date figures, percentages and rules. This article is not tax advice and is not intended as tax advice.